Museum scientist, Kevin Cole, recently spent time with Grahamstown palaeontologist, Dr Rob Gess. A field outing to road cutting close to Grahamstown proved to be an amazing meander back in time to the Devonian period (about 368 million years ago). Passion and dedication on the part of Rob has resulted in some wonderful finds for science. Many years ago he had the foresight to collect a lot of rock separated out mechanically for a road cutting. This rock later revealed interesting fossilised extinct fish species, young coelacanths and the worlds earliest evidence of a scorpion. The interpretation of some of the science can be seen on display at the Albany Museum in Grahamstown (see photo below). The display carries large colourful illustrations ….. fish with armoured plated heads, lampreys (no bone in their bodies), spiny finned fishes (ancestors to sharks), lobed-finned fish, lung fish and fish with jointed armed appendages (see illustrations below). 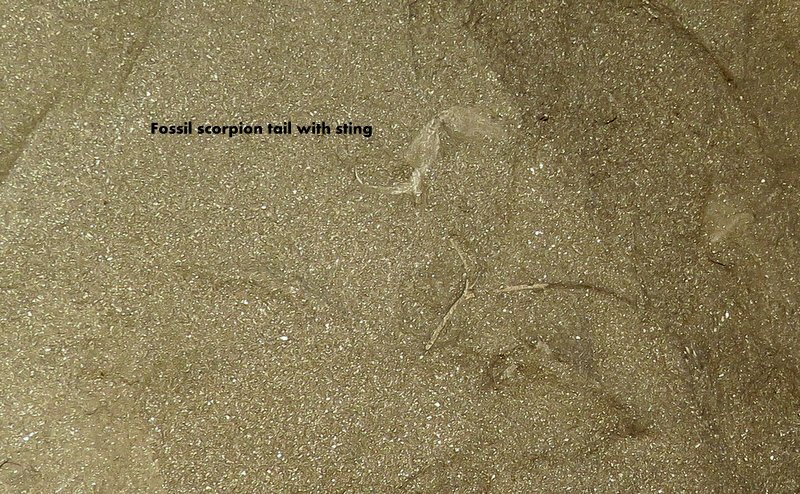 Back in the lab at Rob’s office in Grahamstown rock specimens were presented and one of the samples clearly showed the pincer of a late Devonian scorpion (360 million years old) and another sample the fossil tail with the sting of the scorpion. At that time South Africa was part of a giant landmass known as Gondwana (which later split up into Antarctica, South America, Madagascar, India and Australia). This find represents the earliest land living (terrestrial) animal on this ancient landmass. This new species was named Gondwanascorpio emzanziensis (see photo below).